Gaura lindheimeri is native to the Mexico-USA border area, it forms a clump and reaches up to 4 feet in height and 3 feet in width. Whirling Butterflies has a very long flowering period (from mid spring to autumn). Gaura lindheimeri ‘Crimson Butterflies’ is a vast improvement over the leggy white native species. This Gaura stays compact at only 18 inches tall. It has dark rose colored flowers on crimson foliage, and blooms year round unless dormant. Tolerates high heat, humidity and drought, and is versatile in poor soils. 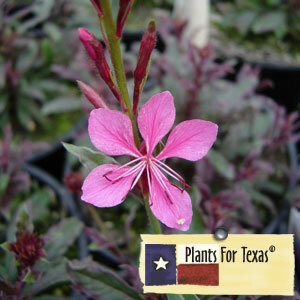 Gaura lindheimeri ‘Crimson Butterflies’ is part of our Plants For Texas® Program, meaning it was Texas Grown, Tested in Texas to perform outstanding for Texas Gardens.